Stay cozy in your Cabin or weekend retreat with our custom "Welcome To Our Cabin" Needlepoint Pillow. This beautiful piece is made meticulously of needle-point with 2 1/2 layers in earthtone shades of green, beige, brown and rustic reds. Backing and piping made of moss-colored velvet. 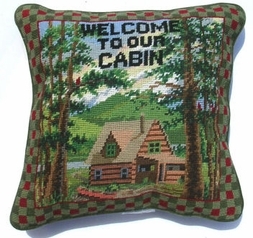 Perfect for a housewarming gift, birthdays, or to simply decorate your favorite cabin retreat.